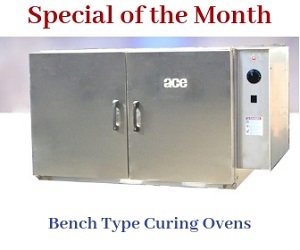 At Armature Coil Equipment (ACE), we provide burn off ovens in various sizes. We work with our customers to understand their requirements, and find an oven size that will support and benefit their operations. As we get many first time customers who are unsure of what oven size to choose, we have included the information needed to help them make the right decision here. The following are the points to consider when finding the right oven size for an industrial facility. Dimensions of Work Environment: The first points to look would be the height, length, and width of the area where the burnoff oven will be installed. This will allow the customer to find an oven size that will fit, and be installed easily. Parts Cleaning Dimensions: The size of the oven will also be determined by the types of parts that will be cleaned. There should be a good amount of air flow when placing the components in the oven, as this reduces the total time of the cleaning cycle. Hence, it is important for the burn off oven manufacturer to know the general dimensions of the parts that will be cleaned using the oven. The oven should be large enough for the parts to be placed in it easily, along with easy installation in the application area. Unlike popular belief, the process to install a burnoff oven is quite an easy process. The only thing that customers should keep in mind is to follow the steps below exactly. The area where the oven needs to be installed should have a level floor, or one with cement padding. Once the oven is set down, the gas, water, and electrical utilities should be connected, and the vents and exhaust stack should be set in place. According to installation regulations, the exhaust stack should extend at least 4 ft. above a flat roof. Also, there shouldn’t be any kind of obstruction within 18 feet of the exhaust stack. The oven should have space of at least 2 ft. on the sides, and at the rear for maintenance purposes. The roll out cart system is designed to load parts into the oven chamber easily. Hence, the area right in front of the oven should be completely clear. This will allow the cart system to work effectively. Care should be taken to ensure that the oven is not installed near or under flammable materials, such as wooden ceilings. The reason for this, the afterburners are capable of reaching temperatures up to 2,000°F. If the oven is placed near flammable materials, there is a great possibility of a fire breaking out. If the oven is placed in an area where it is penetrating a gable roof, then the stack must extend at least 4 ft. above the gable. Our ACE engineers always advise customers to showcase footprint drawings, as this will help us determine the space, and hence, the appropriate oven size. If you would like to see our burn off oven sizing chart, then please click here. If you have any questions about burn off oven sizing and installation, please feel free to contact us.